In an unusual move, Americans for Prosperity is launching digital ads on Friday thanking a vulnerable Democratic senator for sponsoring legislation that rolls back Dodd-Frank regulations. The ad campaign, first reported by CNBC, thanks North Dakota Sen. Heidi Heitkamp, who’s running for re-election in a state that President Donald Trump won by 36 points in 2016. Heitkamp will likely face Rep. Kevin Cramer in November. Inside Elections with Nathan L. Gonzales rates the race a Tossup. Earlier this spring, the conservative political network backed by the Koch brothers ran ads attacking Heitkamp for voting against the Republican tax plan. 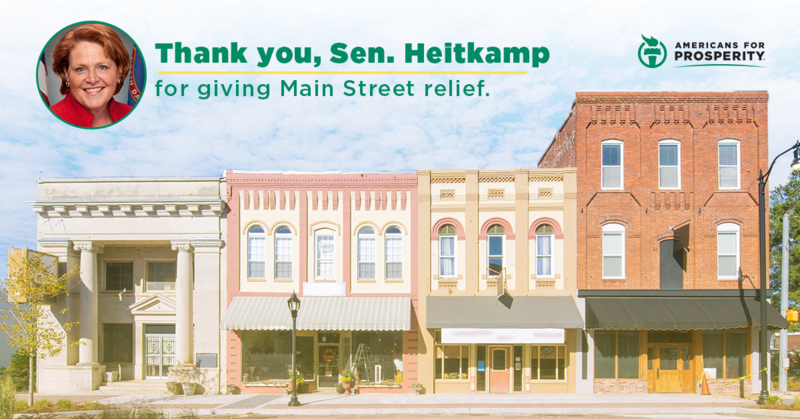 “We hope to find common ground and work with Sen. Heitkamp on other issues moving forward including making tax relief permanent,” he added. Heitkamp was the only Democrat the White House invited to the bill signing ceremony after the bank deregulation bill passed last month. AFP’s support for the first-term senator comes amidst mounting concerns from Republicans that her relationship with the Trump White House could hurt Cramer. “Heidi got results for rural North Dakota families and businesses who depend on relationship lending because she is and has always been focused on putting partisan politics aside to deliver for North Dakotans -- and that&apos;s where her focus will remain,” Heitkamp campaign communications director Julie Krieger said in a statement. AFP is also thanking GOP Sens. Mike Crapo, Cory Gardner, Dean Heller and Ben Sasse and Democratic Sens. Mark Warner, Doug Jones and Michael Bennet for their role passing the deregulation legislation. While AFP typically supports Republicans, the organization is trying to hold both Republicans and Democratic House members accountable for voting for the omnibus spending bill in March. A six-figure ad campaign launched over the Memorial Day weekend targeted Republicans, including Pennsylvania Rep. Lou Barletta, who&apos;s running for Senate. “AFP is committed to working with lawmakers – regardless of party- to advance common sense reforms that help people improve their lives,” Phillips said Friday.